What’s Happening in Birmingham this October 2018? 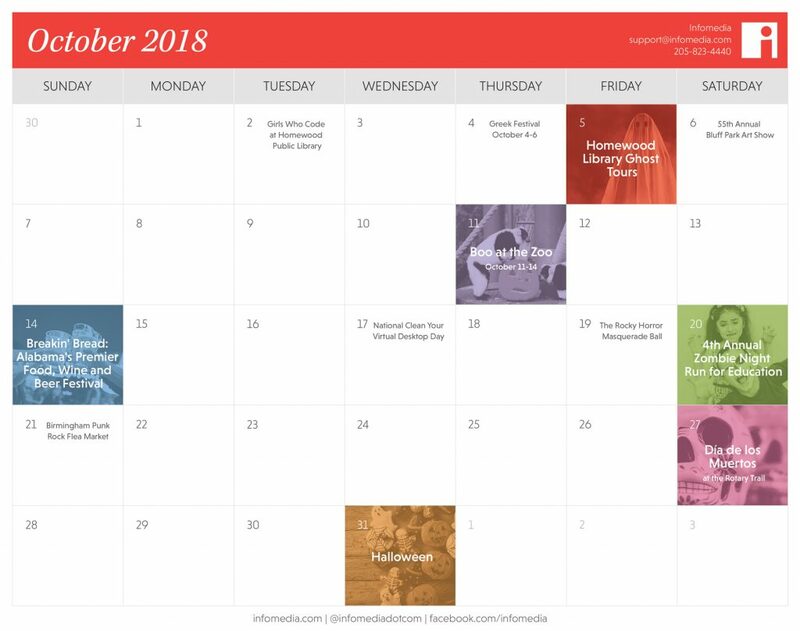 Find Out with Our Free Calendar | Infomedia, Inc.
October is a great month for getting out and about. The leaves are changing, the weather becomes bearable and entertaining events abound throughout Birmingham. From a zombie-themed running race to Boo at the Zoo, there are many fun activities for the whole family. October in Birmingham is the perfect time to don your best costume, grab some great Greek food and maybe even go on a ghost tour. The city is full of fun events, ranging from the Bluff Park Art Show to the Birmingham Punk Rock Flea Market, many of which are free and family-friendly. Don’t miss out on any of the haunted happenings by downloading our free calendar as a reminder. If you’re running social media for your own business, feel free to use our calendar as inspiration for your postings. Have a girl who has an interest in computer science? Then bring them Girls Who Code. This national club is geared towards empowering young women, grades 6th through 12th, in the STEM fields. Laptops aren’t required, but bringing one is recommended. One of the oldest food events in Birmingham, the Greek Festival is a celebration of the local Greek community. The event includes authentic cuisine, Mediterranean souvenirs, Greek music and traditional dancing. For those on-the-go, there’s also a drive-thru option during lunchtime to grab meals. Spend a spooky evening exploring the haunted Homewood Library with the SCARe paranormal team. The group will bring along specialized equipment to assist in the investigation. The majority of the proceeds will go to library itself, helping provide funding for the facility and its various events. Come out and enjoy the creations of 150 artists, from around Alabama and the nation, at Bluff Park’s 55th Annual Art Show. It’s the perfect place for art enthusiasts to spend an afternoon, with free shuttles providing transport to the event. Set out to see the Birmingham Zoo’s transformation into a Halloween wonderland. Boo at the Zoo will include themed rides, spooky attractions and carnival games. Other entertainment includes a trick or treating section and a Monster Mash dance party. Support local food by attending the Breakin’ Bread food festival. Held at Pepper Place, the event will include over 30 Birmingham restaurants serving unlimited samples of food and drink. Also don’t miss the live music, makers’ market and more. The festival benefits Jones Valley Teaching Farm, which encourages academic exploration through food and farming. Whether it’s folders, pictures of puppies you’ve downloaded to send to coworkers or just work documents piling up, having a messy computer desktop can be distraction. So celebrate this national holiday by giving your desktop a little clean. You’ll be surprised how much more organized and efficient it can make you. Rock the night away at the Alabama Theatre’s Rocky Horror Masquerade Ball. Watch the cult classic movie, enjoy music by DJ Stevo and participate in the costume contest. If you’ve ever wondered if you’d survive the zombie apocalypse, now is your time to find out. The 4th Annual Zombie Night Run for Education is a family-friendly event that involves running from zombies. Participants begin with three flags attached to them, and whoever can reach the finish line with all of their flags uneaten by zombies is the winner. The evening will also include give-a-ways, live music and more. The race benefits Holloway’s Gift of Life Foundation, which supports local education. Enjoy Birmingham’s counterculture by attending the Birmingham Punk Rock Flea Market. This year will include over 50 vendors will attend with wares ranging from art to zines and vintage items. Live music will also be performed throughout the day, with the event being totally free and open to all ages. Hosted by the Alabama Multicultural Organization, Día de los Muertos at the Rotary Trail is a cultural celebration open to everyone. The event will take place over four city blocks, featuring altars, dance, music, art and food. It’s a free celebration, but you’ll have the option to pay a small fee to add your late loved one’s name to Día de los Muertos public mural. The spookiest night of the year, Halloween is a great excuse to get out in the community and attend some fun events. Check out your local calendar to find out what is happening near you. Many churches host trunk or treats, bars have drink specials and haunted houses will be in full swing. Be sure to wear something reflective if you’re hitting the streets, and keep an eye out for trick or treaters while driving.